[Warning: outdated post.] I love Saint Patrick’s Day. It seems random I know, but I come from a big Irish Catholic family so March 17th has always been kind of a big deal. 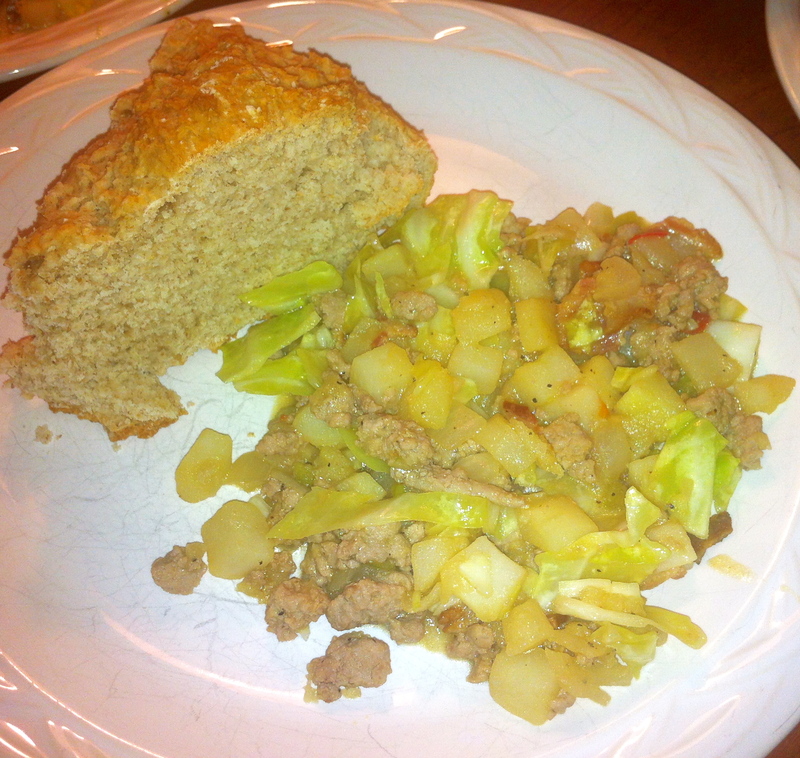 When I was a kid, we’d gather at someone’s house to eat, drink and carry on as we Irish do best. Now that everyone is grown and gone, it’s much harder to organize such get-togethers. Many of my closest family members are at college with me anyway so I figured, why not invite them over for a good ‘ole Irish feast? After much Googling and Pinning I decided on recipes for Irish Skillet Dinner from Tara Cooks, Irish Soda Bread from The Kitchn and Martha Stewart’s Key Lime Pie. 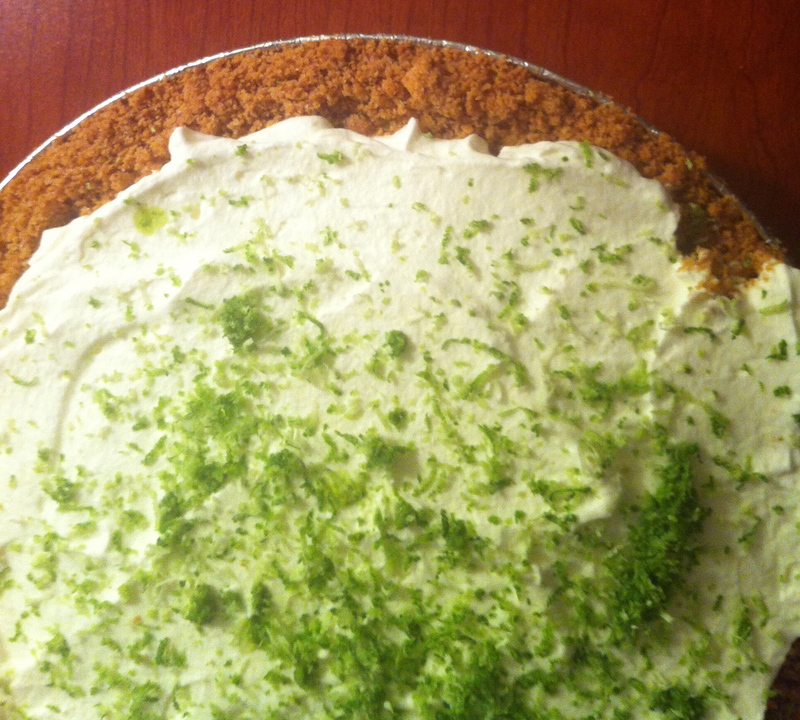 No, Key Lime pie is not Irish, but it’s green and tastes like spring, and therefore perfect. Surprisingly, all recipes were very simple with relatively few ingredients. Everything tasted like home: fresh, simple, good. Even two of my very picky friends cleaned their plates. That’s what’s so great about holidays: they bring people together. I find few things more satisfying than cooking a good meal and sharing with friends. In a small mixing bowl, combine the beef broth, apple juice, white vinegar, yellow mustard, worcestershire sauce, salt, and pepper. Whisk to blend and set aside. 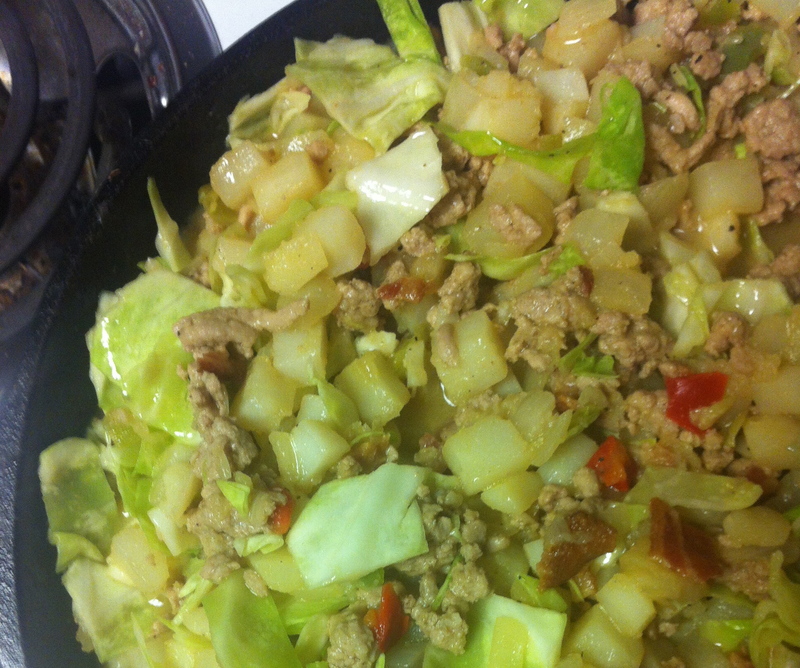 In a large iron skillet, brown the ground beef with the fresh diced onion. Drain any excess grease. Add the vegetable oil and hash browns to the beef and onions. Cook over medium heat for about 10 minutes or until hash browns are lightly browned, stirring frequently to prevent sticking. Add the liquid mixture and the shredded cabbage and bacon and cook another 5-10 minutes over medium heat until most of the liquid is absorbed. 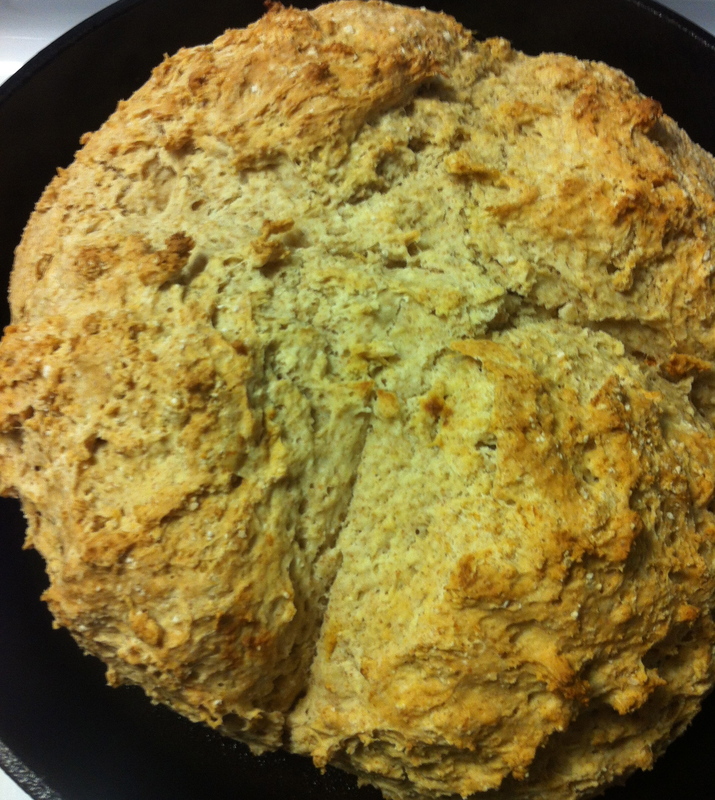 Serve immediately while hot with some Irish soda bread. Prep the ingredients. Preheat oven to 400°F. Lightly oil the skillet or baking sheet (you can also use parchment paper). Cut the butter into small cubes and place on a plate in the freezer to chill. Do not freeze the butter solid or you will have a hard time working it into the flour. Measure and mix the dry ingredients. Measure the flours, baking powder, baking soda, and salt into a mixing bowl. If you are adding sugar, put it in now. Stir with a whisk to combine. Add the chilled butter to the bowl with the flour mixture, and using your finger tips, work the butter into the flour by quickly pinching and rubbing the butter and flour together. You can also use a pastry cutter or two knives. The butter should be fully worked in, without any large chunks left. Add the buttermilk plus any optional additions and form into a ball. Stir with a wooden spoon or spatula to combine. At a certain point, it may seem easier to use your hands to gather the dough into a rough, shaggy mass. Press it into a thick, slightly flattened ball. Place the dough into the oiled skillet. Using a sharp knife, mark a large X into the center of the dough, going all the way from end to end, about 1/2-inch deep. Brush with a little buttermilk. Place in oven and bake. Place in oven. After about 25 minutes, check the bread. If it is getting too brown, tent with a piece of foil. Continue baking, about another 20-30 minutes. You will be able to tell the loaf has finished cooking when the center of the X has lost the wet, shiny look of raw dough. You can also insert a cake tester — it should come out clean. A light thump on the bottom of the loaf should sound hollow. Cool on a rack. Warm soda bread spread with butter is a delicious treat. But don’t cut the bread right away or it might turn gummy in the center. Let it rest for about 10 minutes before cutting into slices, or tearing into chunks. Slather lavishly with salted butter – Irish, of course – and enjoy! Heat oven to 375 degrees. Combine graham-cracker crumbs, butter, and 3 tablespoons sugar in a medium bowl; mix well. Press into a 9-inch pie plate, and bake until lightly browned, about 12 minutes. Remove from oven, and transfer to a wire rack until completely cooled. Lower oven to 325 degrees. In a medium bowl, gently whisk together condensed milk, egg yolks, Key lime juice, and zest. Pour into the prepared, cooled crust. Return pie to oven, and bake until the center is set but still quivers when the pan is nudged, 15 to 17 minutes. Let cool completely on a wire rack. Shortly before serving, combine cream and remaining 2 tablespoons sugar in the bowl of an electric mixer fitted with a whisk attachment. Whisk on medium-high speed until soft peaks form, 2 to 3 minutes. Make sure pie is completely cooled before spooning on topping; then, garnish with zest. Serve immediately.